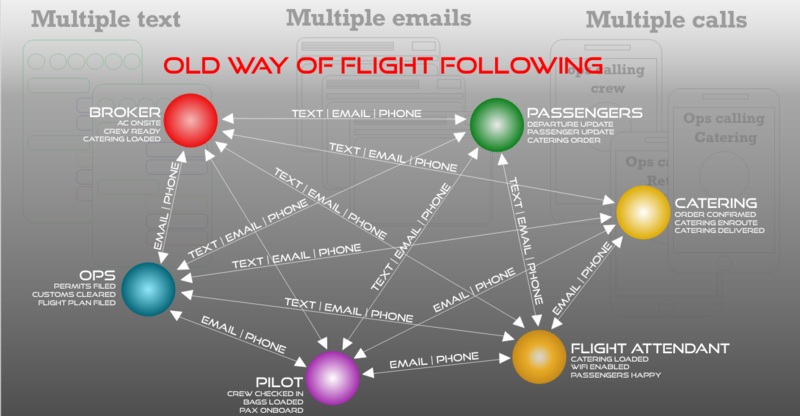 Real time communication and collaboration for simplified flight operations. 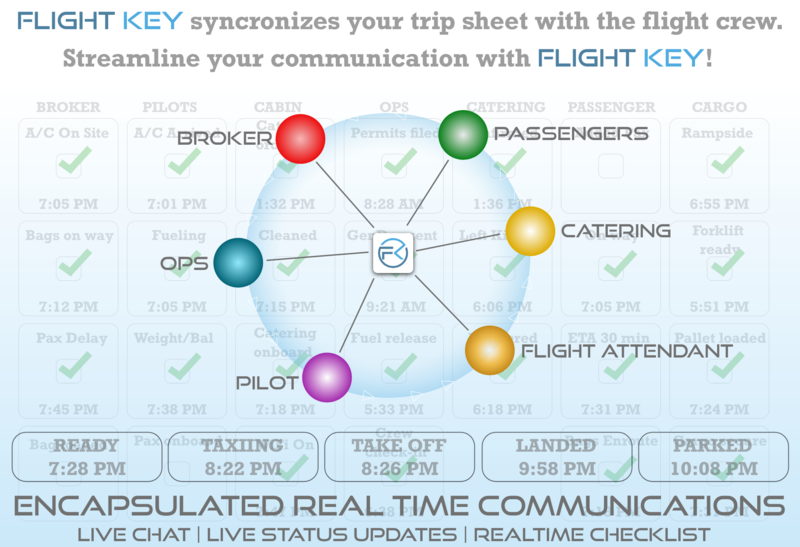 Flight Key is a web based software that does not need to be downloaded in order to use. If you choose to use the app version, you can download on an Android or iOS device. 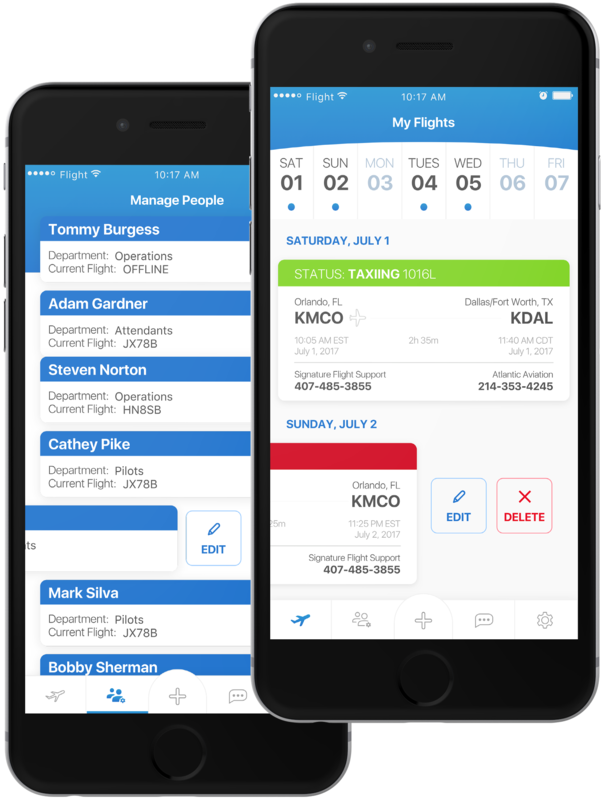 FLIGHT KEY IS A LIVE INTERACTIVE PLATFORM WHERE OPERATORS, DISPATCH, CREWS, BROKERS & PASSENGERS CAN COMMUNICATE IN REAL TIME. A flight is setup on the software, and each participant is assigned a task. Then they simply hit the assigned button when the task has been completed & a notification goes to everyone. For instance, Ops tasks may include, AC onsite, slots granted, manifest loaded, Pilots tasks could be, Crew onsite, weight & balance sent, Fuel loaded, ATC hold 30 min, bags loaded, cleared customs, pax arrived, boarded, doors closed, takeoff, landed, parked, Etc, Catering companies tasks may include, Proforma created, religious restrictions, shopping completed, newspapers, flowers, meet on arrival, photos of catering sent, Etc, FA tasks may include, catering ordered, cabin ready, special items arrived, catering loaded, order correct, pax happy, items left behind, Etc, Brokers tasks may include, bags en-route, pax running 30 min late, pax en-route, add passenger, (scan passport in chat area direct to pilot) Etc, Passengers tasks may include, leaving hotel, 30 min out, Add more champagne, Etc. Just to name a few of the many tasks that are required on a flight. There are already standard templates for you to use, or any of the buttons can be changed to customized any task. Now everyone is watching the tasks checked off in real time on their phone, so there is no longer a need for phone calls, emails, or texts to anyone that is on deck, as they are all busy working the flight. This eliminates any calls to the crew, trying to check on the status of the plane to whether it is green, in order to send out the passengers. So you see, it was designed out of necessity to give everyone more time when working a flight, so that everyone is in the loop in real time, and there is no longer a need to chase information pertaining to any flight. All participants receive real time updates as they are taking place and are accessible on any web browser or device. Single location to view all assigned actions and check them as they are completed. Invite unlimited participants at no additional cost. 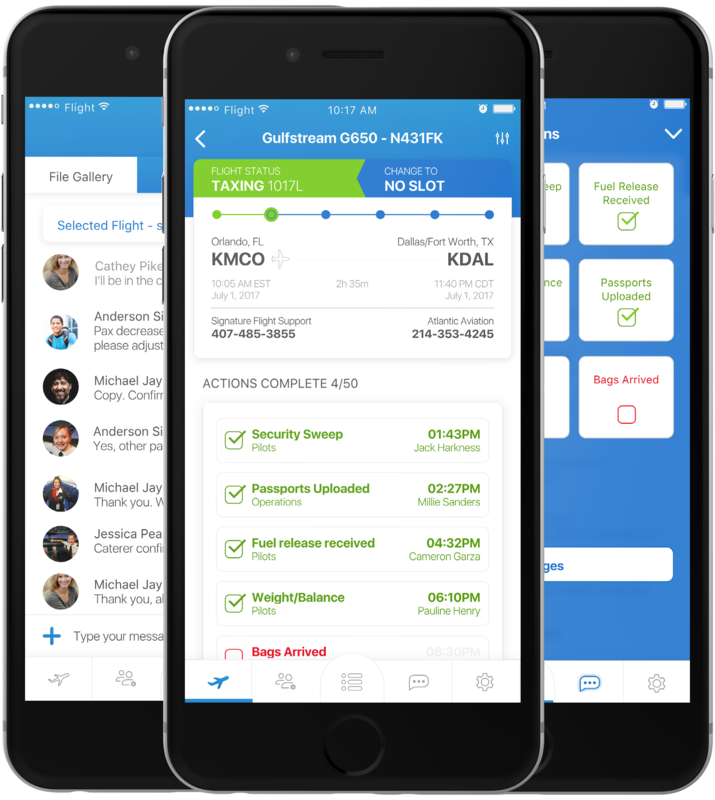 Available on flightkey.com, Android and iOS devices now. When all actions are completed a real time stamped is received. Detailed list of all actions in one location. State of the art encryption is in place to protect all of the participants. 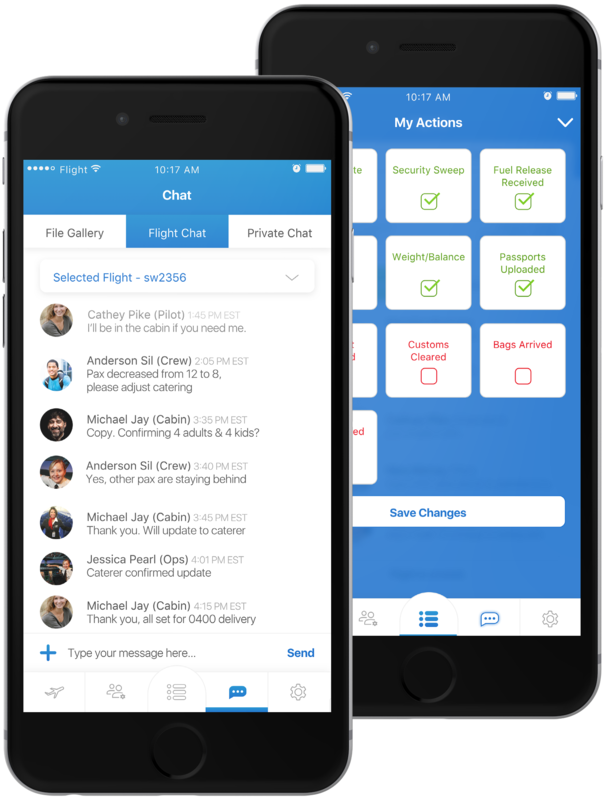 Custom actionsYou can choose from several standard passenger, cargo, catering template lists of actions that pertain to most passenger flights. You can select that list and either delete some and or override and design your own action lists which can be saved for your future passenger or cargo flights. 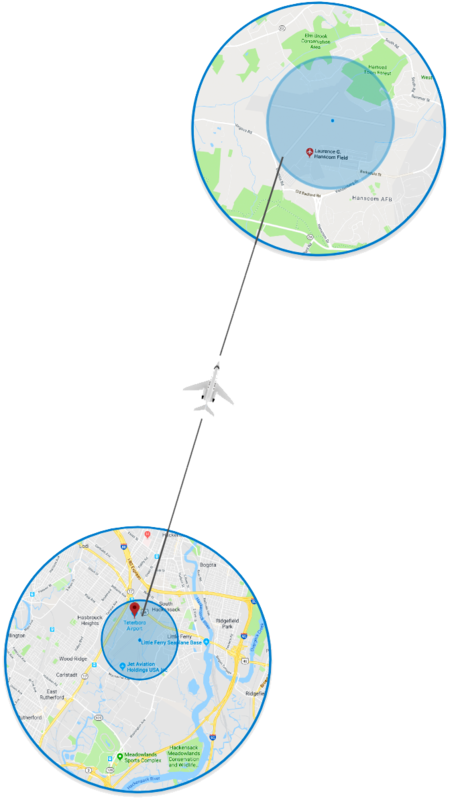 Automated movement messages occur with the assistance of airport Geofencing. The internal barometer of your mobile phone determines the altitude of the aircraft which makes this possible. The assigned participants that are responsible for engaging the status bar on the App, can manually activate the “Take Off" or "Landed" buttons. When the participating crew members mobile phones GPS is enabled, it activates the Geofencing feature and will automatically send a real time movement message to all of the participants without relying on traditional tracking methods. 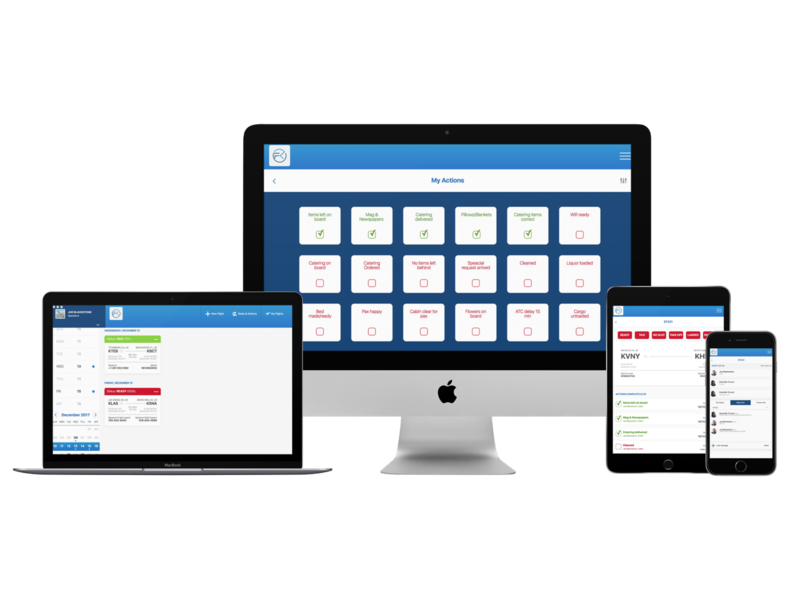 This essentially eliminates your paper trip sheet, by replacing it with a live interactive solution for tracking all of the flight details from beginning to end on any device. This is a web based software for managing, planning, scheduling and monitoring flight operations worldwide. Also available to download for Android on the Google Play Store and download for iOS on the Apple Store. 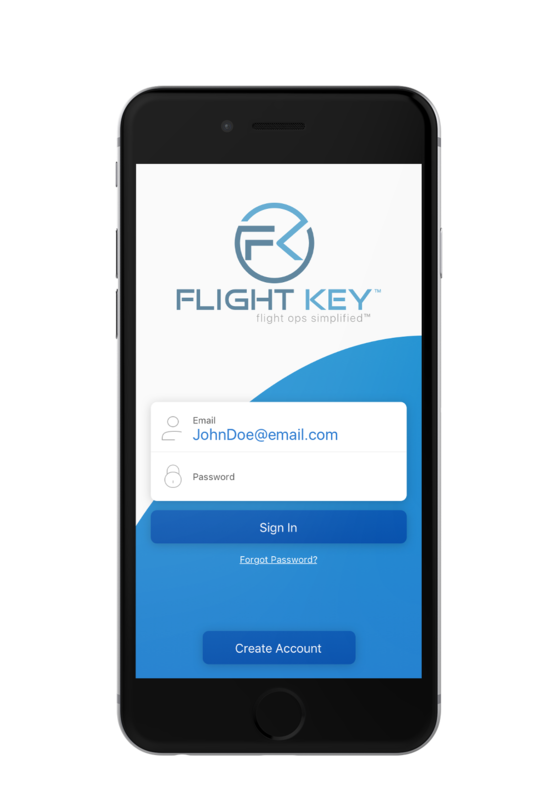 If you are a Operator, Owner, Pilot, Broker, Caterer, FBO, Passenger or anyone responsible for a flight, you need Flight Key. Subscription Membership. Your Flight Key membership, which may start with a free trial, will continue on a six month at a time period and automatically renew unless and until you cancel your membership or we terminate it. You must provide us with a current, valid, accepted method of payment to use the Flight Key service. We will bill the semi annual membership fee to your Payment Method. You must cancel your membership before it renews to avoid billing of the next term. By the flight Memberships. Flight Key may offer a number of membership plans, including special promotional plans with different conditions and limitations. These individual flights do not expire and cannot be refunded. Recurring Billing. At the start of your Flight Key membership, you authorize Flight Key to charge you automatically every six months for the selected subscription with the payment method of choice available in the check out screen. Price Changes. We reserve the right to adjust pricing at any time. Billing Cycle. The membership fee for our service will be billed at the beginning of the paying portion of your membership, thereafter unless and until you cancel your membership. We automatically bill your Payment Method every six months with corresponding to the commencement of your paying membership. Subscription fees are fully earned upon payment. Payment Methods. 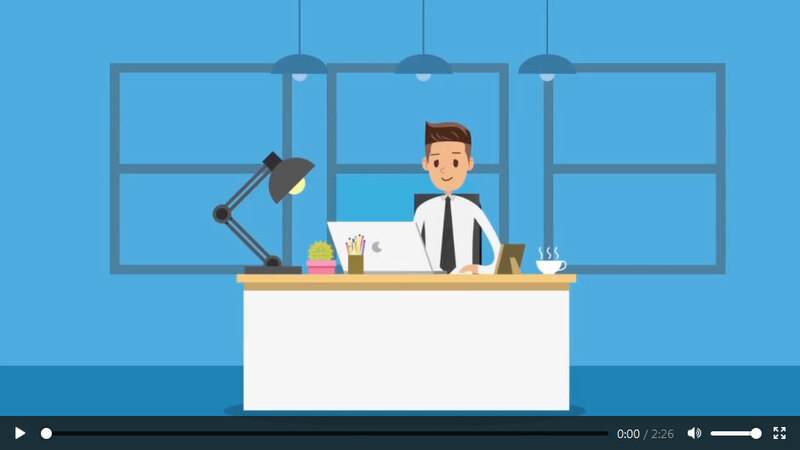 You may edit your Payment Method information by visiting our website and clicking on the “Edit Profile" link, available at the top of the pages of the website. If a payment is not successfully settled, due to expiration, insufficient funds, or otherwise, and you do not edit your Payment Method information or cancel your account (see, "Cancellation" below), you remain responsible for any uncollected amounts and authorize us to continue billing the Payment Method, as it may be updated. This may result in a change to your payment billing dates. You may cancel your Flight Key subscription within 30 days of you subscription ending and at that time you will continue to have access to the service through the end of the six month term. To cancel your auto-renew subscription, please email Support@flightkey.com and put Cancel in the subject line.